Vassilis Fotilas at Fraser Yachts in Monaco writes to say that he's signed the 24.2m motor yacht Lady K of Monaco for sale. 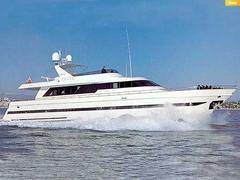 Lady K of Monaco was built by Falcon Yachts in 1994 and refitted in 2000, sleeping 10 guests in four staterooms. A spacious aft deck leads into the main saloon, forward of which is the dining area. The galley is forward to port adjacent to the wheel house with breakfast or crew dining area. An internal stairway leads to the flybridge. Below forward is the VIP double bedded suite and the full width owner’s suite with a large bathroom and walk in dressing room. Aft are two twin bedded guest cabins with Pullman berths and independent en-suite facilities. With a cruising speed of 22 knots, this superyacht is asking €790,000 (VAT paid).